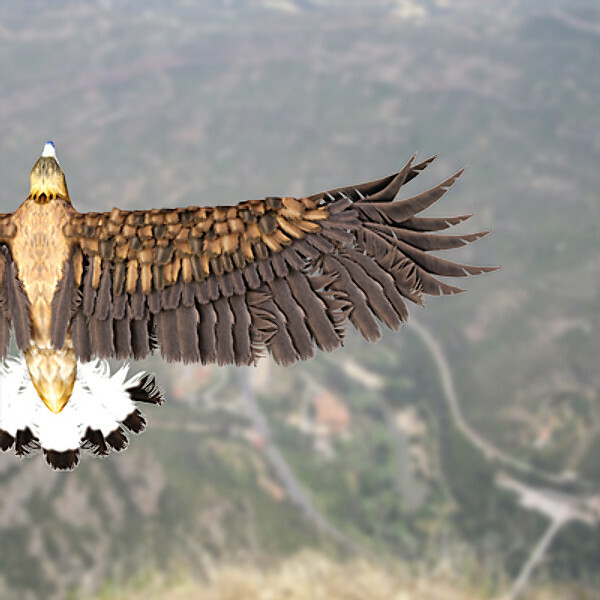 The Facebook composite. 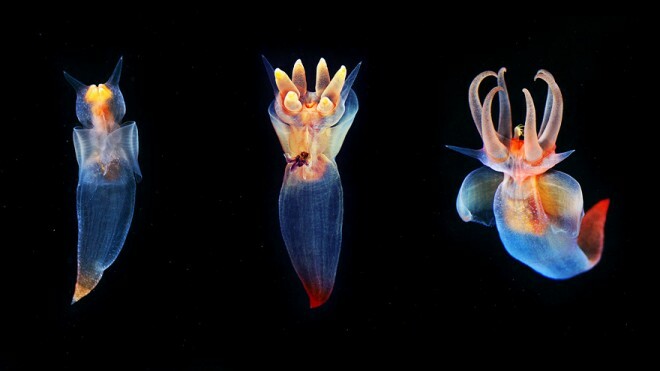 Image Source: Yahoo. "Relax. We're not breaking any Facebook privacy rule because we don't store anyone's private information, pictures or names," [programmer Natalie] Rojas writes. 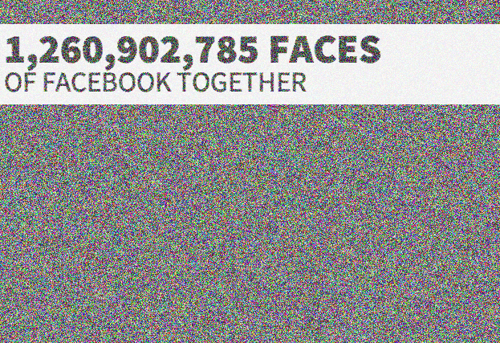 "We've just found a harmless way to show 1,260,866,093 Facebook profile pictures and organize them in chronological order"
You can click here to see the composite and zoom in anywhere to see individual faces. If you move to the top left corner, you can see the earliest faces on Facebook, starting with Mark Zuckerberg at #1. Gesté St. Pierre church 'deconstruction.' Images Source: Yahoo. The Saint-Pierre-aux-Liens, a 19th century neo-gothic parish church was scheduled for demolition in 2007 by the city council. With only the bell tower and crypt remaining, the current church will be replaced in 2016, [with a building] which will be cheaper to maintain. 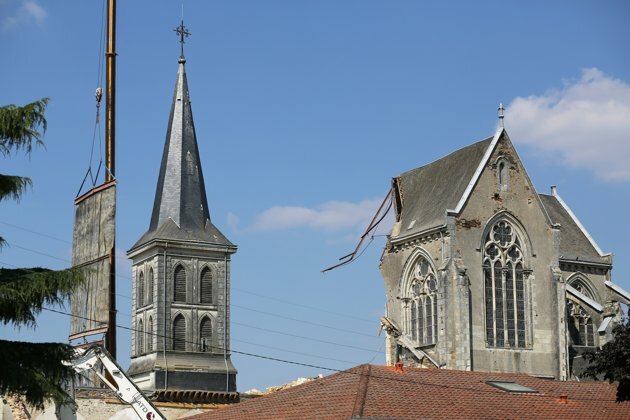 This destruction is part of a large debate across France where villages are faced with churches in deteriorating condition, diminishing populations, fewer parishioners and priests, and increasing upkeep costs. A wave of threatened demolitions in the Anjou area has sparked fears of a wider phenomenon as mayors struggle to pay for the upkeep of the buildings, a responsibility they have held since secularisation laws passed in 1905. No exhaustive list of the nation's rural churches exists. However, of its 15,000 protected rural religious buildings, 2,800 are "in peril", according to l'Observatoire du Patrimoine religieux, a religious heritage watchdog. For some villages it is already too late. In Saint-Georges-des-Gardes, population 1,500, a wall with rusty metal spikes is all that remains of the parish church, built in 1870. The edifice is the latest victim of what mayors call "deconstruction" - a term more usually associated with the French [Postmodern] philosopher Jacques Derrida than knocking down churches. The mayor said a full renovation would have cost more than a million euros. It was far cheaper to build a new one. His move has emboldened several other mayors to consider following suit. In nearby Gesté, a pretty neo-gothic church stands majestically atop the hillside. However, the mayor, Michel Baron, has announced his intention to "deconstruct". 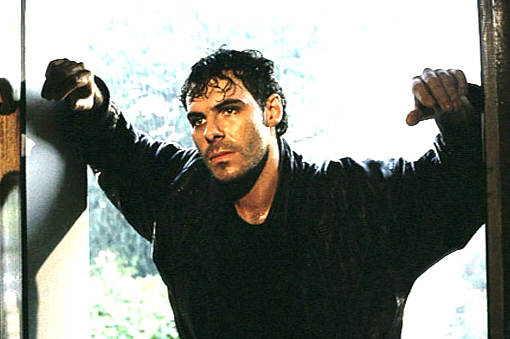 Alain Guinberteau, who runs a website, 40000clochers ... celebrating France's churches, was the first to sound the alarm. Without its church, the landscape of Gesté will be disfigured, he said. "It will be cut off from its past. A part of our heritage and history is wiped away with one bulldozer. France is viscerally attached to its rural churches, which represent the very soul of French villages." Mr Baron said a renovation would have cost three million euros, while "deconstruction" will cost less than half that amount. "We tried to have the church listed to receive public funds, to no avail. In its place we will put a modern hall of 500 seats, easy to heat. Villagers have taken it well," he claimed. However, Jean Leclerc. 62, a villager, said the decision was shocking. "Lots of people are unhappy about it," he said. "We are not against modernity but the village will lose a lot of its charm and history." The local priest, Pierre Pouplart, refused to take sides. "These are matters for the local authorities," he said. In Valanjou, 45km away, where another church faces its last rites, locals have formed a defence association. "There is a great deal of resistance," said René Cottenceau, 67, its president. "About 80 per cent of the villagers are against the move. The safeguard of our heritage is being overlooked. Just at a time when we are coming to appreciate the value of such buildings, ours is to be knocked down." The church's plight has attracted the attention of the art historian Didier Rykner, who runs the art review, La Tribune de l'Art. 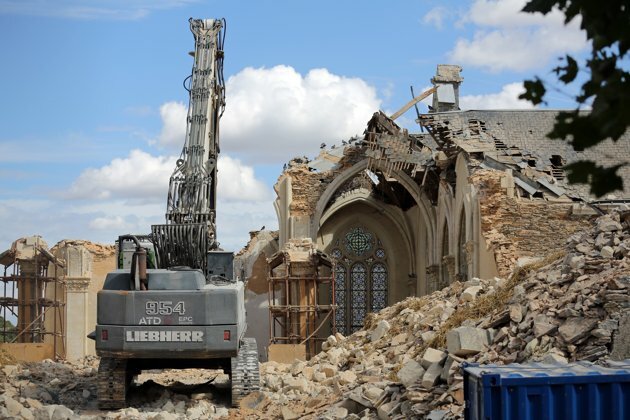 "Not since the Second World War have we seen churches reduced to rubble," he said. "These mayors are the new enemy. They are in the process of destroying the very soul of their own villages. Churches don't just have historic and artistic value, they have intimate personal histories attached to them - christenings, weddings, funerals." I wonder if this is less a story about the collapse of older values and economic problems, and more a story about local government. The 20th century - with its 'Hemoclysm' that saw the deaths of some 180 million people - was an object lesson on the perils of how different states could overcentralize according to various ideologies. Practically universally, the lesson came back that overcentralizing, no matter how you do it, is a bad idea. Despite fears from the political right wing and libertarians during the Great Recession that Keynesian-styled government spending will create bloated centralized states, perhaps the larger Millennial trend - spurred by technology - is that governments are essentially decentralizing. The implicit rationale for decentralization goes something like this. If a government can perform closer to the people it is meant to serve, the people will get more out of government and, in turn, will be more willing to accept that government’s authority. The rationale is compelling, and despite the potential pitfalls associated with implementation, most scholars agree that a decentralized system of government is more likely to result in enhanced efficiency and accountability than its centralized counterpart. Still, disparities between the theoretical rationale for decentralization and what is actually gained in practice are gaping. I am only guessing that local governments are becoming stronger in unusual ways. In the French case, it might be tempting to attribute these stories to the decline of Christianity and eroding communities in France. But many citizens are very upset about France's demolished churches. Maybe deconstruction of churches is just the French 'local flavour' of a much larger pattern in the developed world. The salient question is: why are local people so helpless against the very local officials whom they elected? There is something else at work here besides changing values. Other odd examples come to mind. The Swedish police have just confirmed that they kept illegal records and family trees of thousands of Roma people, based not on criminal activity, but on biological data. A host of American cities have gone bankrupt, most famously Detroit. There are many reports in Canada about municipal authorities acquiring ever more power, even as they slash services, and their budget demands nevertheless continue to skyrocket on fiscally unsustainable paths. This is a non-transparent, mysterious, general trend across the country, which has emerged over the past 20 years; the trend is evident in property taxes, municipal debt, local corruption, municipalities' insurance premiums, policing - although this view is challenged by critics. Central governments, seeking to cut costs and deficits, fob off their expensive policies and programs on local authorities. Strangely, the economic pressures on town councils offer them a 'get out of jail free card' to exercise greater autonomy and to enforce strange policies in the name of cutting costs. In other words, localities are going broke, but they're becoming more powerful because they're going broke. Another facet of this trend is the rise of municipal politicians to national levels of power. Something tells me this pattern is at work in France. Will the 21st century provide history's cautionary tales about the dangers of overdecentralization? See related stories on demolitions of churches across France, here, here, here, here and here. 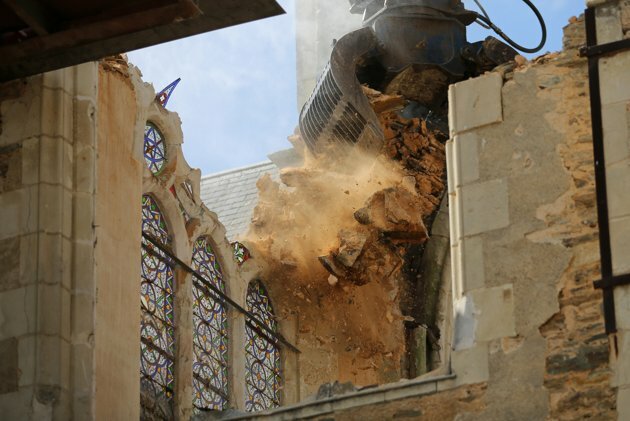 Below the jump, a video of the demolition of the church of Saint Jacques in Abbeville, France in April, 2013.